9 Great Recipes for Super Bowl! Get the best recipes to serve for your Super Bowl party right here! We've got wings, we've got guacamole, we've got cheesy bread, we've got you covered! So, what are you serving up for Super Bowl Sunday? Here are some of the best recipes for cheering on your team. Enjoy the game! 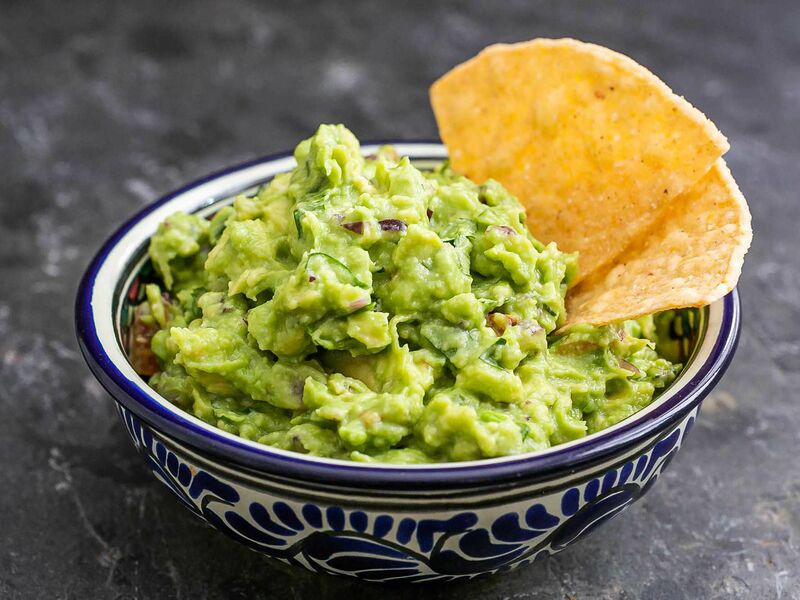 Guacamole: What’s Super Bowl Sunday without guacamole? This is our favorite avocado dip, with fork-mashed ripe avocados, salt, lime juice to start, and then whatever add-ins you want, like serrano chiles, red onions, tomato, and cilantro. Ginger Honey Chicken Wings: Irresistible, addictive chicken wings! With a fresh ginger, honey, and soy sauce marinade with just a touch of heat from Sriracha. Great for feeding a crowd. Cheesy Jalapeno Pull Bread: It’s a cheesy bread hedgehog! This one is so much fun to pull apart. Each bite is loaded with Monterey Jack cheese, and chopped jalapeños and green onions. Spinach Artichoke Dip with Bacon: How to make a great spinach artichoke dip even better? Put some bacon in it of course! Want to skip the spinach and bacon? Go simple with this quick and easy artichoke dip. 7 Layer Bean Dip: Everyone loves a 7 layer dip, right? This one starts with hot refried beans, so think of it as a warm dip with lots of toppings. Popcorn: Looking for something simple and healthy? Making popcorn on the stovetop is easy if you know how to do it right. No uncooked kernels or burnt popcorn. Sprinkle with your favorite taco seasoning! Potato Skins: Just like twice baked potatoes! But without most of the potato part. These are the crispy buttery skins that you bake stuffed with shredded cheddar cheese and chopped bacon, so good! Top with sour cream and sliced green onions. Cheesy Bread: What’s Cheesy bread? Think garlic bread that has been slathered cheese and toppings, like pizza! It’s a huge hit for parties. Buffalo Chicken Dip: First there was Buffalo Chicken Wings. Then there was buffalo chicken dip! Think Ranch dressing meets cheddar and cream cheese meets Franks Buffalo Wing sauce, all baked until hot and oozy. Perfect for bread dipping! Chili Recipes: Still want more ideas for Super Bowl? Check out our favorite chili recipes! Hearty chili for big appetites. Loved your recipes. As the most others did, I tried your cheesy bread, it was a big hit. Made the cheesy bread recipe yesterday for the Superbowl and all of my friends went crazy over it! I used a loaf of homemade Italian bread I had lying around and smoked provolone b/c I didn’t have any mozzarella. It came out wonderfully cheesy and delicious! Thanks for the recipe! I wish I looked at this before today! The potato skins look sooo good (as does everything else)!! That cheese bread looks soooo gooood! Elise, I made your cheesy bread for our Super Bowl party yesterday and added bacon to the mixture (because I simply can’t resist the stuff) and it was fantastic! Rave reviews from everyone. I made that cheesy bread last week, and my god was it good. For the Super Bowl though, I think I’ll be making these delicious Zesty Mexican Blintzes. They require accompanying guacamole, so I’ll try your recipe instead of using the usual packaged seasoning mix. I have been looking for an additional snack recipe for our Super Bowl party today. The cheesy bread is it! It looks perfectly gooey and decadent, plus it only requires one hand to eat so that the other hand is free for high fives and fist pumps. You forgot the hummus! I use your recipe every time I make it, and every time it’s a success! This is a great idea posting Super Bowl recipes! Ooooh, I can’t wait to indulge, I’m more excited for the food than the game! I will be making your potato skins and my favorite buffalo wings, hooter’s style…they are ridiculously good. Have a fun game day everyone! Wow…Great set of recipes! Thanks for sharing with all of us! Every time I look at that cheesy bread, I swear I gain a pound. but it looks so good!